In 2045, a boy escapes dull reality by playing a virtual reality game called OASIS. Ready Player One is directed by Steven Spielberg and was released on Mar 29th, 2018. 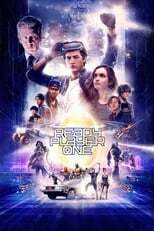 Director Steven Spielberg's Adventure & Science Fiction movie Ready Player One is produced by Amblin Entertainment & De Line Pictures & was released 2018-03-28.